PHILADELPHIA, PA--(Marketwired - July 05, 2017) - A new Health Union national survey, Skin Cancer In America 2017, reveals that patients often struggle with the shock of diagnosis and fear of recurrence once treated. 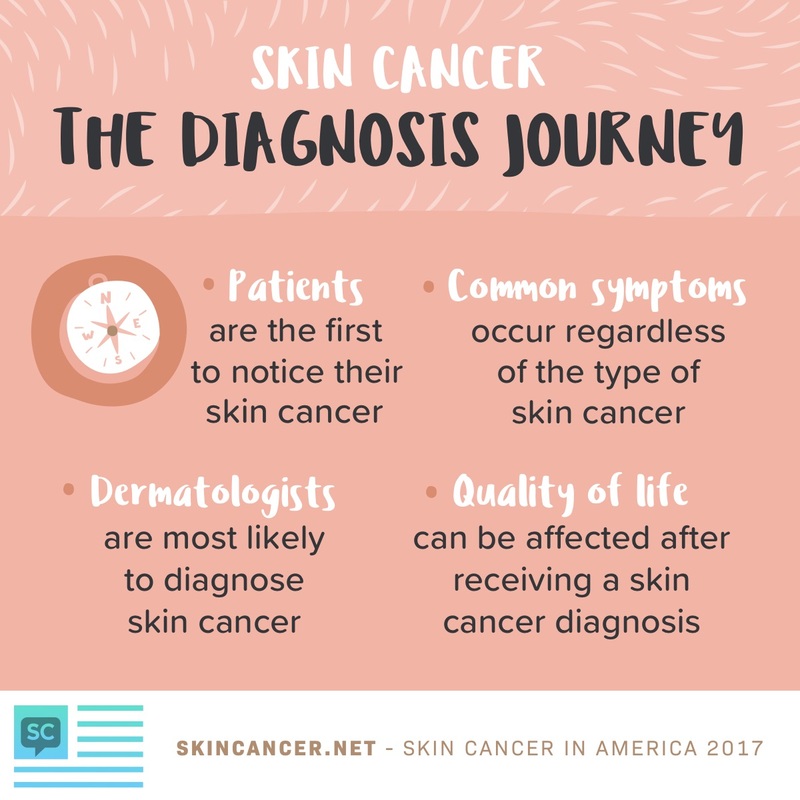 The survey of more than 900 individuals diagnosed with skin cancer was released in conjunction with the launch of the newest Health Union online community, SkinCancer.net. Skin cancer is the most common cancer diagnosed in the United States, affecting nearly 3.4 million Americans annually. Basal cell carcinoma (BCC) and squamous cell carcinoma (SCC) are the most common types of skin cancer. Melanoma is a much less common type of skin cancer, but it accounts for 75 percent of all deaths from skin cancer. Among the Health Union survey respondents, 57 percent had BCC, 46 percent had melanoma, 44 percent had SCC, and 10 percent had another type of skin cancer. Due to the fact that many skin cancer lesions can be removed but cancer often returns, 42 percent had more than one type of skin cancer. Skin Cancer can often be detected early if people keep an eye out for common signs such as reddish patches of skin, or changes in moles that include looking for variations that involve asymmetry, border, color, diameter, and edges -- called the ABCDEs. More than half of BCC and SCC survey respondents had reddish patches of skin, and more than two-thirds of melanoma patients had a mole meeting the ABCDEs of skin cancer. Judy Cloud, a patient advocate for SkinCancer.net, who has been treated for BCC and SCC, notes the problem. "Many people tend to not give much thought to skin cancer, until they or someone they know are diagnosed with it," Cloud said. "Unfortunately, there typically hasn't been as much information readily available about skin cancer as other types of cancers, nor are support groups prevalent." In spite of treatment, patients said they are most concerned about the possibility the skin cancer may return. Seventy-six percent of survey respondents were the first to notice changes in their skin symptoms, which may help with earlier diagnosis. Even after treatment, patients may remain hyper vigilant looking for changes in their skin, which can result in stress and anxiety. "That's why I am so excited -- and thankful -- for Health Union's SkinCancer.net," Cloud added. "It's a place people go for information and support and also be able to share their experience. No one should fight this alone, and with SkinCancer.net, no one has to." SkinCancer.net patient advocate Scott Matheny, who has lived with melanoma for 30 years, agreed. "Skin cancer is deadly, misunderstood, and yet, we now have data-driven information to help us mitigate the risk and comfort the afflicted," Matheny explained. "An online community like SkinCancer.net is critical to saving lives and helping those who are suffering." Even with the support of friends and family, 33 percent of skin cancer patients reported their condition negatively affects their mood and emotions. 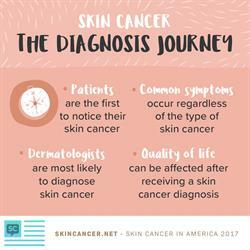 "The results of this survey give us a better idea of the journey for people living with skin cancer," said Tim Armand, president and co-founder of Health Union. "People come to SkinCancer.net because they are uncertain of their future and are looking for support and reassurance. We are excited to be able to provide this much needed resource." The Skin Cancer In America 2017 survey was conducted online between February 21, 2017 - April 10, 2017. More details about the survey are available upon request. Health Union inspires people to live better with challenging health conditions -- combining new, original content every day with digital, social and mobile technologies to cultivate active online health communities. Health Union platforms are unique ecosystems dedicated to illuminating the voices and experiences of people with type migraine, rheumatoid arthritis, type 2 diabetes, and more. Its services and offerings foster open and honest interactions about these health conditions between and among patients, caregivers, professionals, providers and industry partners to help all stakeholders make more informed decisions about healthcare. SkinCancer.net is Health Union's online community dedicated to people living with skin cancer, where patients and supporters of people living with this condition can connect, share experiences, and learn about managing the condition. A new national survey, Skin Cancer In America 2017, reveals that patients often struggle with the shock of diagnosis and fear of recurrence once treated. The survey was released in conjunction with the launch of the newest Health Union online community, SkinCancer.net.